With a vibrant palette of neons, pastels and patterns, John Chamberlain’s Softened by Snow is a stellar example of the artist’s ability to create aesthetic beauty out of discarded materials. 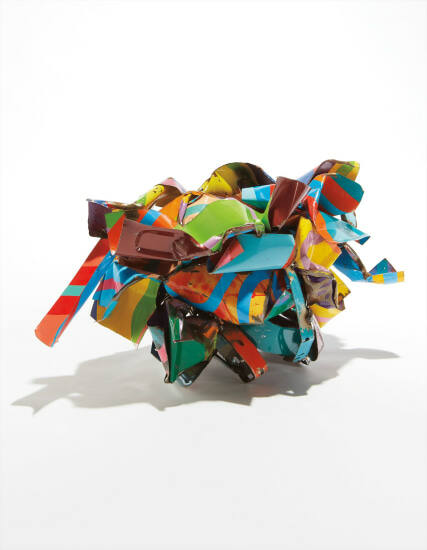 Casted and modeled out of glossy painted car parts, the present sculpture exemplifies Chamberlain’s expert manipulation of the material into a solid, singular form. As he has explained of his practice, "I wasn't interested in car parts per se, I was interested in either the color or the shape or the amount. Just the sheet metal. It already had a coat of paint on it. And some of it was formed...I believe that common materials are the best materials". Measuring approximately two feet tall and over three feet in length, Softened by Snow stands with protruding elements at its widest points, as if exhibiting a sort of personified presence. The amalgamation of these parts, delicately crushed and meticulously reconfigured, possesses a kinetic energy that is at once solid and animated. In colors inspired by both the Abstract Expressionists with whom Chamberlain was contemporary and the graffiti artists surrounding him on the streets of New York, the individual components that make up the present lot visually read like three-dimensional brushstrokes. Renowned as one of contemporary art’s most revolutionary sculptors, Chamberlain is a true expert in the medium which he has founded.